But the problem is that comparing the specific power of an engine – that is, how many kilowatts per litre – actually tells you very little about how good an engineering job has been done. Why? 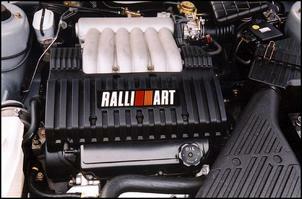 Well, it takes into account only two aspects of the engine – how big it is, and how much power it develops. But since for a given torque value, power is dependent on engine revs, without including engine rpm in the comparison it simply has little significance. So how do you do it, then? 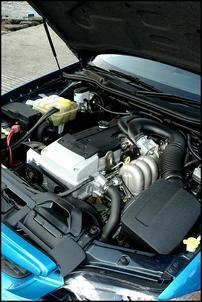 The answer is to calculate the engine’s Brake Mean Effective Pressure, usually abbreviated to BMEP. ‘Brake’ in this context is the same as used when saying ‘brake horsepower’ (bhp). The brake refers to an engine brake that is applied to the crankshaft output. 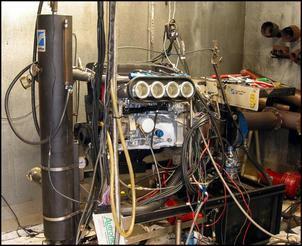 (We normally call an engine brake a dyno.) So whenever the word ‘brake’ is used, it refers to an actual engine output, as opposed to a theoretically calculated figure that might not take into account internal frictional losses, etc. ‘Mean’ is a fancy way of saying average, as in the mathematically calculated average value. ‘Effective Pressure’ is just as the name suggests – the pressure in the combustion chamber that actually has an effect on the piston. So, BMEP refers to the average pressure that acts on the piston during the engine’s four strokes. The higher it is, the more the design has been optimised. 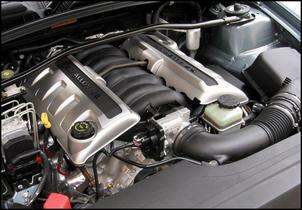 And the key thing about BMEP is that it takes into account engine rpm, engine volume and engine power output. It’s the only equation to use when comparing engines from the perspective of saying which is more highly developed. It doesn’t matter whether the engine uses pushrods; 2 valves per cylinder, 4 valves per cylinder or 5 valves per cylinder. 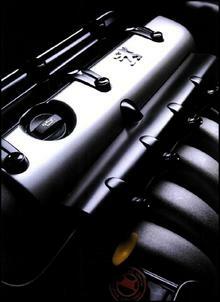 It doesn’t matter whether the engine revs to 8000 rpm or 1500 rpm. You can use the equation to directly compare any 4-stroke engine, whether it’s 660cc or 5.7 litres. 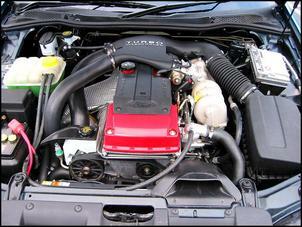 And you can even use it to compare naturally aspirated and forced induction engines. The BMEP figure for a forced induction engine will have a major advantage, but it’s still a valid method of comparison. This gives BMEP in Bar, but that doesn’t really matter that much because it’s the comparison number we’re after, not the absolute. So let’s take a look at some engines. The Honda Type R engine mentioned by our reader in the first paragraph (or the one we tested in 2002, anyway) has a 2-litre engine that develops 147kW at 7400 rpm. Put the figures into the equation and a BMEP of 11.9 Bar results. Now, what about the AMG 6.3 litre? 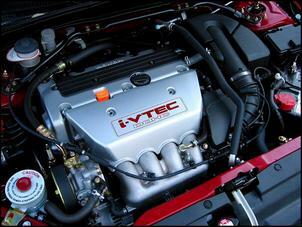 It has 375kW at 6800 rpm, giving a BMEP of 10.5 Bar. So yep, the Honda engine does better. But before Honda owners get too cocky, how about some other comparisons? The BA series Australian Ford Falcon six cylinder uses a 4-litre straight six to develop 182kW at 5000 rpm – and that’s a BMEP of 10.9 Bar! OK, it’s not as high as the Honda engine but it’s better than the AMG! So what about some other engines? 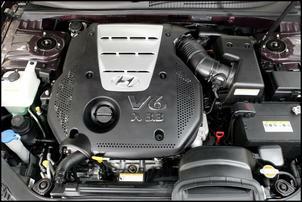 The Hyundai Sonata V6 is one of the more impressive engines we’ve driven lately. 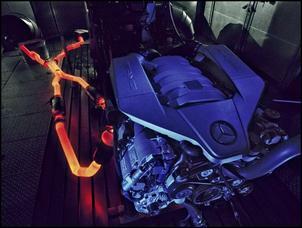 It develops 173kW at 6000 rpm from its 3.3 litre engine. You can see just by glancing at the figures that it’s going to be close, but probably a bit worse, than the Falcon. How come? Well, the Sonata’s power is down a bit, the engine a little smaller – but it needs higher revs to do it. And when you do the equation you’ll see the Sonata V6 has a BMEP of 10.5 Bar. The latest iteration of the Holden Monaro sees it equipped with a 6-litre V8 developing 260kW at 5600 rpm. BMEP? It’s a paltry 9.3 Bar! The Peugeot 206 GTi 180? It uses a 2-litre engine to produce 130kW at 7000 rpm. Will this challenge the Honda? Nope, not with 11.1 Bar although that high figure shows the degree of engine development. In his 2001 book, Formula 1 Technology, Peter Wright lists the BMEP of the 1967 Ford-Cosworth DFV as 14 Bar at 8500 rpm and a 2001 F1 engine at 13.8 Bar – but that’s at 17,500 rpm. But there’s no getting away from it, Honda does produce excellent naturally aspirated engines, whatever the method of analysis. 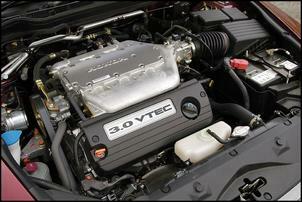 Take the 3-litre Honda Accord V6, with 177kW at 6250 rpm. Do the figures and you’ll see a BMEP of 11.3 Bar! 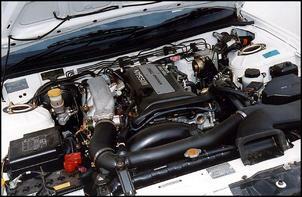 The SR20DET-powered Nissan 200SX in its last S15 model developed 147kW at 6400 from its 2 litres. Just looking at those three figures you might figure that BMEP isn’t going to be very high – but at 13.8 Bar it’s better than the Falcon. 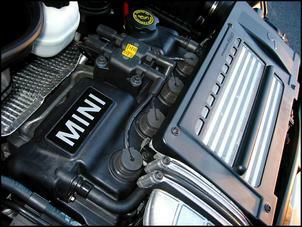 But then take a look at the Mini Cooper S with its supercharged 1.6, developing 120kW at just 6000 rpm. It has a BMEP of 15 Bar! BMEP figures don’t tell you the whole story. They don’t show BSFC (Brake Specific Fuel Consumption) and they don’t show the spread of engine torque, the engine’s flexibility or any of those other real world characteristics. But a BMEP figure is still a far better means of comparison that kW/litre... even if calculating BMEP shows just how good that Honda Type R engine really is!